There's a lot of talk these days about radio communications and emergencies. That's understandable. When "The Big One" hits, we will likely not have phones or internet to communicate. Think about that: If you woke up tomorrow morning with no land line, no cel phone, no internet, no TV, and no way to leave the neighborhood, how would you find out what was going on? How would you signal for help? How would you contact your loved ones? The obvious answer, especially to those who survived the 1989 Loma Prieta earthquake, is radio. Radio doesn't need transmission wires, is easy to use, and can both receive and transmit. While we all know the rule "turn on your radio" in an emergency, we tend to think of radio as a "receive only" process. We have an AM/FM radio receiver, a radio station has a transmitter, and we can listen to what those who are transmitting are saying. But it's also an inexpensive and public method of two-way communication as well. The public is relegated to certain bands, and some need special licensing and equipment, but citizen-use radio bands for the most part in the United States are public and available 24/7. For the average citizen looking into creating a survival kit, there are three types of radio to focus on: Family Radio Service, General Mobile Radio Service, and ham radio. Most people who've picked up a radio at Target or Costco are familiar with the Family Radio Service, or FRS. 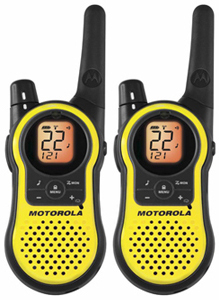 These are what we call "walkie-talkies," but good ones are considerably improved from the basic ones. These don't suffer the interference from Citizens Band radio (CB radio, or colloquially, "trucker radio") or from radio-controlled toys. They're great, but they are low power and can only transmit a few blocks. In an emergency, FRS radios are okay to talk to your neighbor down the street, but they haven't been a really great way to get info into and out of your neighborhood. This has changed slightly in the last year. Previous to 2017, FRS radios only had 14 channels and could only transmit at 0.5 Watts — a trickle of power. Last May, the FCC changed its rules to allow FRS to use 22 channels with up to 2 Watts. Depending on where you're standing, this can expand the reach of FRS to a mile or so. Despite the increased power, FRS is considered very-short-distance two-way communication. FRS does not require a permit to use, but because of these changes in the law FRS-only radios are not available for sale at the moment (details about that later). General Mobile Radio Service (GMRS) is a short-distance two-way radio service that many who want to step up from the basic walkie-talkie have chosen. As of 2017, GMRS uses the same 22 channels that FRS uses, but at a much higher power — 5 Watts to 50 Watts, depending on the channel. This gives them a significant distance boost from FRS. A handheld GMRS radio, with limited interference from nearby buildings and an inexpensive "whip" antenna extender, could easily transmit five miles. The real advantage of GMRS is the fact that they can also use repeaters. Repeaters are dedicated stations that do exactly that — repeat your signal. Using a repeater, a GMRS radio could get a signal over hills and as far as 20 additional miles from the site of the repeater. Picking up a small handheld GMRS radio is fairly easy and inexpensive. A good one, the BTech V1 GMRS radio, is about $60 and the recommended whip antenna extension is about $15. However, to legally use GMRS, you must get an FCC permit. At only $70 to cover an entire household for 10 years, it's not expensive and there is no test, just registration. Instructions and online application are available through the FCC website here. Here's the thing you have to keep in mind with both FRS and GMRS: Previous to the 2017 rule change, consumers could easily buy combination FRS/GMRS radios. Many of the radios we have in our homes have this option. As of 2017, the FCC no longer certifies these types of radios, and in September 2019, it will become illegal to import, manufacture, or sell them in the USA. And if an outdated combo radio interferes with the signals of new, lawful radios, the user could face penalties. Nevertheless, until the cutoff date, these radios are still being sold to unsuspecting buyers. So, keep that in mind: The death knell has been sounded on your old FRS/GMRS combination radios, and don't buy any new radio that says it's FRS/GMRS. Ham radio is, for the purpose of disaster planning, the gold standard of citizen-use radio. Depending on your equipment and setup, you can talk to the other side of the globe with a ham radio. Some ham radio setups talk to the International Space Station (yes, they really do), and there's clubs in the area devoted to earth-to-space ham communications. There are tons of clubs and enthusiasts globally who are wild fans of the hobby. For example, it's standard practice for hams to keep logs of who they've talked to and where they're from, and most have these logs spanning back many decades! Ham radio is not something anyone can just pick up. While you can get started with equipment using a small, fairly inexpensive handheld ham radio, in order to actually use these bands you must take a test and be licensed. Licensing is done in stages; first as a technician, which allows you access to some bands, and then as a general licensee, which opens up most of the rest of the ham bands. For those who want the whole banana, a third Extra license allows highest-tier access. Woe to the unlicensed user who attempts to communicate on ham channels without a license and unknowing of ham protocols! These people protect their bands from intruders, and you'll not find much graciousness if you're on a ham band without a legal call sign. And that handheld radio won't get you very far. Eventually you'll want a home base-station, which, depending on what you buy and how deep you go into the hobby, can run just few hundred to many thousands of dollars. While this is a very rough outline on radio bands, it doesn't answer the question, "What do I really need in an emergency?" The answer depends on where you live in Point Richmond, how far up the hill you are, and who you want to talk to. The city-side hilltops are going to have an easier time getting communication to the rest of Richmond and can use the less expensive options. The water-side will have an easy time talking to cities in line-of-sight across the water, like San Francisco, Berkeley, or San Rafael, as long as they have equipment with enough power, but may not be able to get to the other side of the hill to Richmond. If you're in a canyon, or down on the flats of Point Richmond and there's tall buildings nearby, you're going to have a harder time getting most places without the more powerful radio options. Maybe you don't want to talk to downtown. Maybe you just care about getting a signal to somewhere in the Point who can relay your request to authorities. 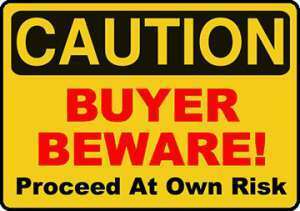 Knowing what your target is BEFORE you buy your radio will keep you focussed on buying what's right for you and not overspending. The only way to know what your situation is will be to identify your purpose, get with someone who knows radio, and test it out at your location. Then keep testing with others who have radios in your area to learn who might be listening when you call for help. These on-air get-togethers, called "nets," run on regular schedules. Participants all turn on at the same time, and the organizers calls out for anyone listening to check in. It's a great way to find out how far you can hear, how far you can transmit, and where the other radio owners are, so you can call on this info in an emergency. Our schedule of local nets can be found here. PR-CERT team members are happy to help anyone looking for a disaster preparedness communication solution. Let us know if you're interested in picking up the right radios for your family.